Within the first few minutes of A Love so Beautiful, you're charmed and filled with warm fuzzies. The story is well balanced with the cast, color palette and music all working in harmony. Take a seat back, and enjoy this drama. Synopsis: This review is based on the first few episodes and the online synopsis don't seem very accurate. From what I have seen so far, the story follows a group of five high school friends and centers around life-long neighbors Jiang Chen, Chen Xiao Xi, and the gradual development of their relationship. Jiang Chen is an intelligent, introverted character that mostly keeps to himself. Though, unlike the typical anti-social genius male leads, he is more realistic, socializing with other students and participating in events. Early on it's revealed that despite his constant rejection of Chen Xiao Xi's pursuits, she's actually the person he's most comfortable with. Eventually, through her sincerity and the appearance of love rival Wu Bo Song (Gao Zhi Ting), he starts to like her at a painfully slow pace. This is my first time coming across Hu Yi Tian. I'd say his acting is impressive, with a nice and soothing tone of voice. I look forward to more of his work in future dramas. 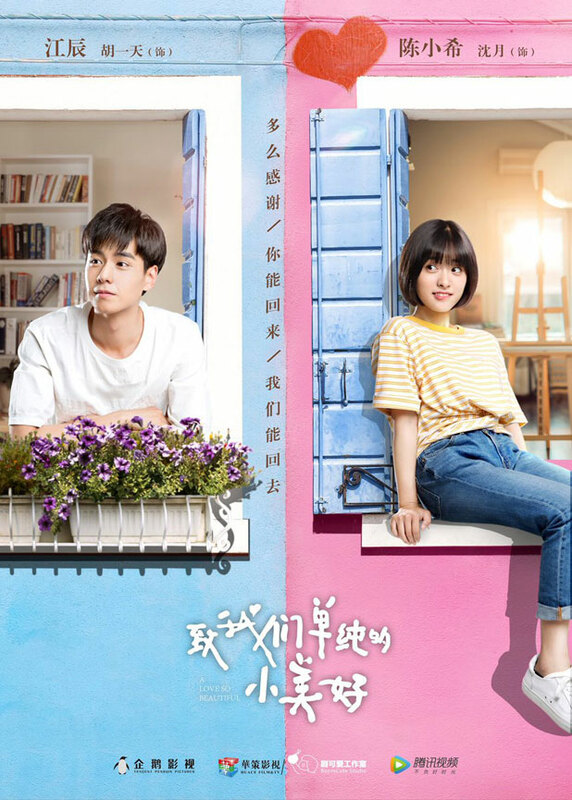 Chen Xiao Xi, played by Shen Yue, can be described in one word, CUTE! She wears her heart on her sleeve, sulks at the drop of a hat and can just as easily become cheerful. Chen is steadfast in her one-sided love for Jiang Chen. She has liked him for so long that pursuing him is simply part of her daily life, not being too phased by his rejections. The character completely relishes in any attention Jiang gives her. As a side note, Shen Yue will be playing the lead in the 2018 remake of Meteor Garden. Based on her acting in A love so Beautiful, she is well casted for the role. As we get to know each member of the group, each episode shares more depth in the characters. All normal students, facing various issues with complicated families, bullying, unrequited love, and the pressure to get good grades. Themes in A love so Beautiful have similarities to It Started with a Kiss, Hello Mr. Right, and Big Boss, but with it's an approach of realism. Unfortunately, for now, this drama is under the radar and not getting the love it deserves. The rest of the story seems promising and I am looking forward to continue watching it. Thanks for reading this review! For more drama musings, be sure to stop by my blog. The drama is similar to Itazura Na Kiss. The recent taiwan drama Attention Love was also similar to Itazura Na Kiss. In Love So Beatiful, the main guy and main gal are neighbors and their parents know each other. In Itazura Na Kiss, the main guy and main gal were living in the same house. Love So Beautiful also has the love letter from the main gal. In Love So Beautiful, the main guy is a lot smarter like in Itazura Na Kiss but in Love So Beautiful, the main guy and the main gal are in the same class so the main gal is probably also quite smart. Love So Beautiful also has an episode where the main gal needed to improve her rank to 15th in class whereas in Itazura Na Kiss, the main gal wanted to improve her rank to within the top 100 among the various classes. Both Itazura Na Kiss and Love So Beautiful have a likable second male. There are so many similarities between the shows, I haven't watched Love Attention, but people are saying its really good. This drama is like the fresh breeze in the air! It's totally a feel-good drama. Highly recommended!! It really is like a fresh breeze! Glad you are also enjoying it! SPOILER ALERT: Love, love, love it. I like the chemistry between the main five actors. I like how the two main male leads are pursuing the main female lead, but they are not playing dirty tricks to each other. They are also doing a great acting job. Agreed! Its so fun that our opinions of the drama are similar and on the same wave length! @ AndreaK: Totally agree with you. I feel so bad for BS, but I want her to be with JS. I hated Playful Kiss and never finished it so I don't think I'd like this but people seem to be loving this drama on the different sites I've visited so I think I might try it out and at least the heroine here doesn't appear to be a spineless ninny like in Playful Kiss and the lead male seems more likeable and realistic. I love your comment! The main guy in Playful kiss is such a jerk. This drama is definitely more chill and realistic. I'd give it to episode 3/4 at least, that's when we see his kind side. If you give it a go, let me know if you love or hate it! Lol I guess I'm the only one who liked it started with a kiss? Guy's a jerk and the girl's so dense but I loved the TW version and fell for the characters anyway. I think the actors made it work at least for me:) I hardly watch school dramas anymore, but am curious to try this too since it seems like a better, more relatable version by all accounts. ha, I actually also really like the TW version because of the amazing natural chemistry between them. All the acting was so natural, it's almost hard to believe they all don't exist in real life lol. Thanks for the article. I really loved the novel and am enjoying every little bit of the drama. I'm just a bit disappointed that they cut a lot of my favourite parts of the story. 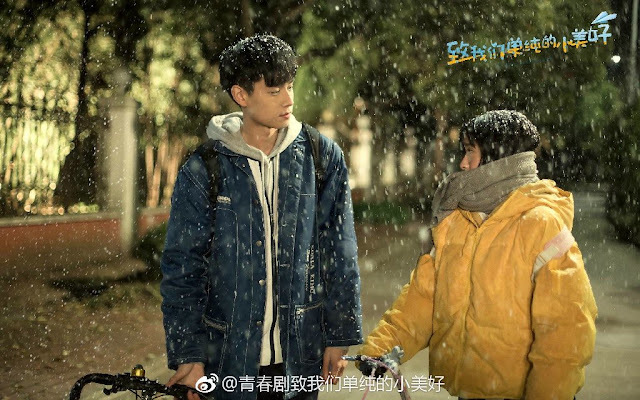 The drama focused a lot on their high school days and coming-of-age, which was a good thing - this made a lot of Chinese viewers nostalgic of their old days and is one of the main reasons why this "low-production" web drama is picking up popularity (so don't worry, it's doing quite well in China ATM, just not with international fans). I just wished that since they made the high school part 16-17 episodes, they would have extended the drama. The past 4 episodes (17-20) flashed by so fast. Most of the novel was based on after their reunion years after breaking up. I still really love this drama though and I do like the 2 new characters they introduced so I don't have much to complain aside from the pacing of the drama. That's so cool that you read the novel! Do you think they'll end up doing a season 2 to flesh out the 17-20 age? I have only seen till episode 13 and don't know yet if a second season is possible. Which are the two character they introduced in the drama? Would LOVE to hear any other important bits that the novel has that's missing in the drama. I don't think they will do a second season. It seems like they will just speed through their adult life. I accidentally came across the trailer and found it super adorable. Then I looked up when it will actually air when I came across the novel online, in traditional Chinese too. I saved the chapters and read them while commuting. I did scan through some parts cause I'm a CBC and quite a lot of my Chinese was self-taught. - Bo Sung was from a really messed up family. His mom married the father of her first love as revenge for her first love's mom breaking to two up. Since she couldn't marry her first love, she decided to be his step-mother, complicated eh? - Anyhow he was only at Xiao Xi's school for one semester cause he got sent by his rich dad to New Zealand. But then his family actually went bankrupt later and he returned to China. So he wasn't a swimming athlete. 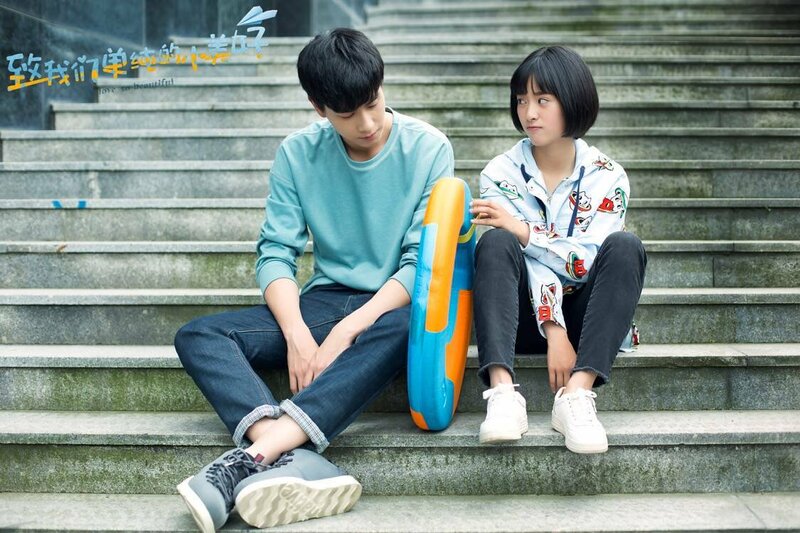 - Also, Bo Sung had some good feelings for Xiao Xi but it wasn't that strong and wasn't really considered love so nothing really happened between them, they're just really good friends. Bo Sung got rewritten as a typical second lead for the drama. His love story in the novel is complicated as well, but it involves another character not in the drama. - Jiang Chen's dad is alive in the novel. In the novel, his parents are important figures in their "village/town". He doesn't have a younger brother either. His mom is not as nice compared to the drama. His parents were the reason why Xiao Xi broke up with Jiang Chen cause they looked down on her. Also why Xiao Xi's dad didn't like Jiang Chen when they were adults. - Li Wei didn't play a huge role in their high school days though Xiao Xi always felt inferior to her. In the novel, Jiang Chen's mom pushes for Jiang Chen to marry Li Wei in the future. - there's another character, the younger brother of the doctor who does Xiao Xi's dad's surgery. He has one-sided crush on Xiao Xi. I'm not sure if he'll be introduced in the final 3 eps. The siblings were quite fun in the novel. - their reunion was also a little different and funnier in the novel. Xiao Xi's dad did get hospitalized and was the reason why Xiao Xi and Jiang Chen got reunited. But he was in another hospital that was quite corrupt. Xiao Xi was about to visit the doctor's office to offer money when Jiang Chen "accidentally" called her. Xiao Xi remembered Jiang Chen was a well-known doctor and then called him. He helped her transfer her dad to his hospital and that section was really sweet. - There was this funny part where a nurse overhears her phone call and asks Xiao Xi for help to transfer to another hospital as she was almost done her internship and didn't want to sleep with the director. Xiao Xi replied that she just called a janitor at another hospital and promised to sleep with him so he would ask for a transfer. Sorry for almost writing the whole novel here XP Couldn't help myself. Anyways, I hope that was at least interesting. Let me know if there's anything else you wanna know. Thank you so much for taking the time to write this!!! It really helps me understand the story more. Bo Sung family story is so messed up, no wonder they changed that for the novel. Also makes sense if the book based on the authors love experience, makes for such a richer more realistic story. where I can read the novel? Do you happen to know if they have this novel in English anywhere? If you do - would you please share the link? I looked for it, but I couldn't find it. Thank you very much for your help. One of the reasons why it's more real is because the original novel was based on the author's real life love story. Thank you for the summary of the novel. I wish the drama covers more of their adult & married lives.